Sidewalks, subways, skyscrapers – the common denominator in these widely varied constructions is concrete. The ubiquitous material in all construction, concrete is the 'medium' with which builders and masons like AAP Construction work. Don't mistake cement for concrete – concrete comprises a cement paste of only fifteen percent plus crushed rocks or stones, sand or gravel and gypsum. By varying the balance of the mix, we control the final product and we've been doing it since 1993. We know all these details – and many more – because concrete is our 'sculpting medium'. At AAP Construction we consider ourselves the 'Artisans of Concrete'. We'll make your swimming pool, we'll build your foundation, and we'll construct your retaining walls – all with concrete, but using different balances and different mixes, and we will do so with an artisan's pride. That said and though we have been in the business since 1993, we are honest workers with no airs and graces. 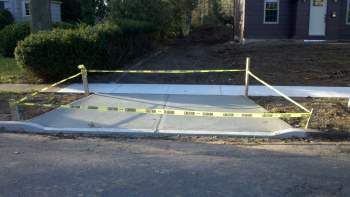 If you want something as simple as concrete slabs for a sidewalk, we'll be pleased to make them for you. AAP Construction will do your Concrete work today but will return tomorrow and the day after tomorrow. you see, to develop maximum strength concrete needs to be 'cured' by water application for from two to five days after the concrete is prepared. We will make it a point to conscientiously carry out the full 'curing' process so that you get the hardest, strongest concrete. Want to learn more? Do you have a Concrete job, be it large or small? Don't hesitate – phone us at (973) 298-1013 and a friendly professional will be happy to pay you a no-pressure, no-strings visit!